Mrs. Eleanor L. (Mathieu) Traversy, age 103, a resident of Lowell, passed away peacefully on Thursday morning, January 31, 2019 at the Willow Manor Nursing Home. She was the wife of the late Henry J. Traversy. 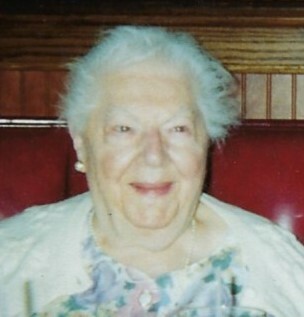 Born in Lowell on November 1, 1915, she was a daughter of the late Alfred and Marie (Bourgeault) Mathieu. During her life she had been a Mill girl and then later attended Holy Ghost school of Nursing in Cambridge which is now known as Spaulding Hospital. Eleanor worked as a nurse in Cambridge and at the former St. Joseph Hospital. She also performed missionary work for Haiti. She is survived by two daughters and a son in law, Denise “Dee” L. Nelson and her husband Rick of Lowell and Shirley M. Traversy and her fiancé Robert Griffin of MD; she is also survived by nieces and nephews. She was the last survivor of her many siblings. TRAVERSY – Eleanor L. (Mathieu) Traversy. It being her wishes, all services will be held privately at St. Joseph Cemetery, Chelmsford.